Last month, not long after its late 2016 launch, this $50 USD Android tablet was recalled due to the faulty charger that shipped with it. Now it looks like the issues have been ironed out and the NOOK Tablet 7" is available for purchase once again. When designing cheap tablets, some sacrifices need to be made to keep the price as low as possible. The Barnes & Noble NOOK Tablet 7" has no specs or looks to impress and, sadly, it also came with defective chargers as well. This $50 USD tablet launched back in November 2016, being recalled in late February. Now, everything seems to be back on track. Those who missed the NOOK Tablet 7" back in November might want to take a look at the specs - quad-core MediaTek MT8163 processor, 8 GB internal storage and microSD support up to 128 GB, VGA front camera and 2 MP main image shooter on the back, as well as 7-inch IPS display with 1,024X600 pixels that Barnes & Noble advertises to be "optimized for reading," and more. 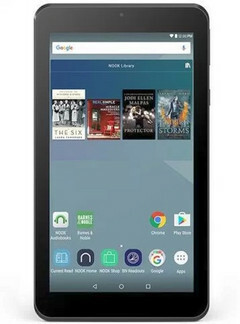 The NOOK Tablet 7" comes with Google Play store support, and its battery can provide up to 7 hours of mixed use. This slate is currently listed as available for $49.99 USD and is also eligible for free shipping.